Popcorn! Get your popcorn here! I love food costumes and this was one of my favorites. The basic idea behind this costume included LOTS and LOTS of glue gun sticks and LOTS and LOTS of popcorn, but making the actual costume was pretty simple. The costume is fundamentally made with two loops of wire connected at the corners by another piece of wire, a basic wire frame. I then covered this with plain white paper, the kind that comes on the rolls and bought the same kind of red paper. I cut strips of the red paper and glued them on with glue stick. I took an undershirt and glued on a thick coat of popcorn with hot glue. I also made a popcorn hat. Then, I covered the top of the costume with white paper so that I could glue more popcorn on the top. My school has a “most spirited award” and with this costume I won! Hi Laura! Your costumes are awesome! How do you get the box costumes to stay on? Do you rig some kind of suspenders, are your boxes closed more at the top, or do you just carry them around with you? i have made this costume to but you’s is so much better!! 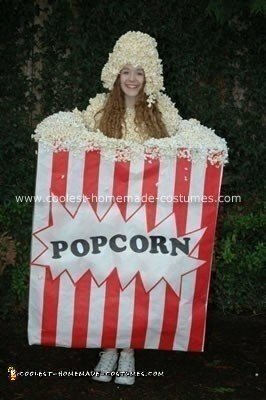 this is the best popcorn contest i have ever seen in my life. how the heck did you come up with this?!!!!! I LOVE IT!!!!!! !